Model 415 VX Series is a Single Auger Vertical Feed Mixer with a mixing capacity of 415 cu. ft. and it can hold a maximum load with a heavy ration of up to 9600 lbs. This model is available only as a trailer. The low profile and short loading height allows for easy loading with skid steers. 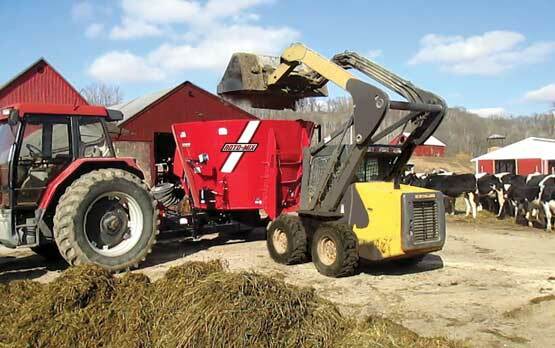 A durable modular design with the simplicity of a single auger produces a high quality mix. The discharge can be either right of left hand side with conveyors an option. It is equipped with a low maintenance planetary gearbox and the heavy-duty tubular frame has four-point scale mounts. This feed mixer is for small to medium-sized dairy, cow/calf, stocker and heifer operations. For small to medium-sized dairy, cow/calf, stocker and heifer operations. Hubs, standard, lbs. 10 bolt 10,000 lbs.